We had been preparing all winter for the big trip my girlfriends family had graciously invited us on. It was a very appealing offer to me since I had never been there. We were told that climbing one of Yosemite’s highest peaks was no easy feat, it would take months of preparation. So, we began with planning. Thankfully her family had already figured out where we were staying during our time there. With the biggest part of the planning out of the way, all we had to focus on was the food and supplies we would need for the trek. Everything was looking good. We were ready. And then catastrophe struck! We had found out two weeks before that the trip had been moved a week sooner than planned and we weren’t going to make it. I, however, had already booked a ticket to California for the trip. So, I grabbed my best hand luggage and was off without a plan in sight. After my arrival, we began to research other things we could explore in Yosemite. We figured we could drive up to the park on our own and see whatever we could without permitting. 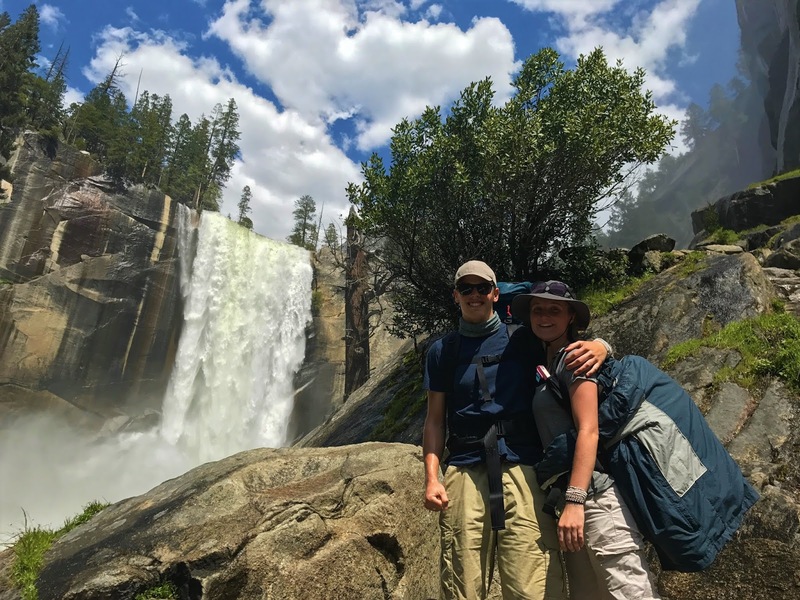 We were under the assumption that there was no way to climb Half Dome without the permits that must be reserved months in advance. So, we began our search for all the exciting things to see throughout the park and found that even without our previous goal, there was still enough to keep a nature lover busy for years. 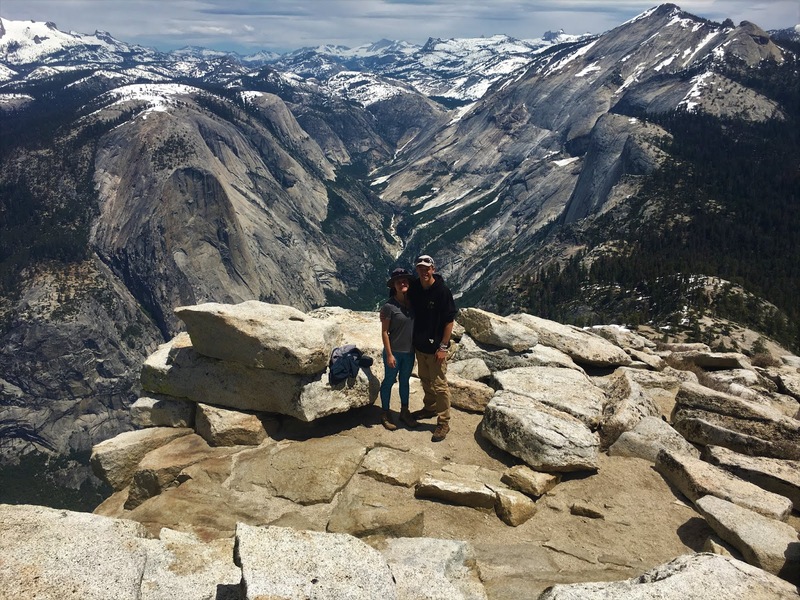 We discovered an article explaining the reason why you needed a permit to climb Half Dome was to keep the crowds down to a controllable level. The only way up is with two cables lifted off the rock face to form a handrail. Even with strict permitting, these cables are insanely mobbed during the summer months. What we didn’t know was that the cables don’t go up until mid-May and go back down at the end of summer. However, the cables don’t actually go anywhere. They’re only lowered off the stands that hold them up for easy access. As it turned out we didn’t need permits for Half Dome itself. In the brief period where the cables are down, and the weather is still warm enough you can make the climb. That tends to be only a few weeks before and after the summer months. It may be more dangerous but It’s the only way without a permit. Even though they can’t legally stop you, anyone you ask in the park service will explain the danger of a 400-foot vertical gain on a 45-degree slope of slick granite. All that on top of the 8,000 + feet in elevation. We were also told that in this “shoulder season” there are no rangers up there so we would be alone should something happen. Needless to say, they don’t want you up there when they aren’t in control. Being young and crazy, we decided to go for it anyway. Without an ounce of a plan, we called a couple friends and picked a date. And by the time we all met up, we had a grand total of one day to buy and pack everything we would need in the car. Walmart was surprisingly good for our tight budget. We were able to get everything on our list for a three-day camping trip. With, food out of the way and other camping gear acquired from a friend we were as prepared as we were ever gonna be. Here’s how it went! We left the brown treeless Bakersfield eager to find ourselves in Yosemite’s lush green forests. On our three-hour drive north, we all began to feel the excitement building as we sang along to the radio and watched as we pushed farther and farther away from civilization. The hills on the horizon began to grow and fields started to turn to trees. Eventually, we came to the winding road leading into the valley. The only campsite we could find for the first night was just outside the boundary of the park and was flooded with people overflowing from the limited camping available in the park. We stopped only long enough to set up camp and then we were off to explore what we could before the sun went down. The drive to the main entrance got more and more stunning the closer we got. Every corner revealing a new unbelievable view. And that wasn’t even the park yet! Once through the main gate, the road entering the park goes through a series of tunnels as it traverses the dramatic landscape. Finally, we made it down into the Yosemite Valley and decided to drive the main loop around the park and stop when we saw something interesting. Which incidentally was everything. Before we even got to our first pick on the map we saw a group of people off the side of the road looking at something. And of course, we stop to see only to find a family of bears casually strolling by. I guess I can check seeing wild bears off my bucket list. Moving on from there we stopped at countless viewpoints surrounded 360 degrees by the astonishing granite formations and more waterfalls than one could count. The sheer beauty is something straight out of a fairy tale. Our first day was a complete success. We could only hope it would continue. Back at camp, we discussed the game plan over dinner. Which was to get up at the crack of dawn and go straight down to the ranger station to get on the waiting list for the first come first serve camping permits. Our plan was to camp at the Little Yosemite Valley campground which is the halfway point. Even though the hike can be done in a day we decided to try for the permit and break it up. By the time we got up to the counter, I was frantically doing the math on how many permits were left. And just as we took the last step I realized there were exactly four left. It couldn’t have been luckier. The universe was on our side. And we were finally ready! Our next big challenge and probably the biggest was trying to find a spot in the overnight parking lot. Three of us split up and searched for a spot while the other drove. And by the time we found a spot, it was a race to get on the trail. We popped the trunk, threw our packs over our shoulders and just like that we were underway. It started with a huge boost of excitement and energy as we marched up into the mountains. 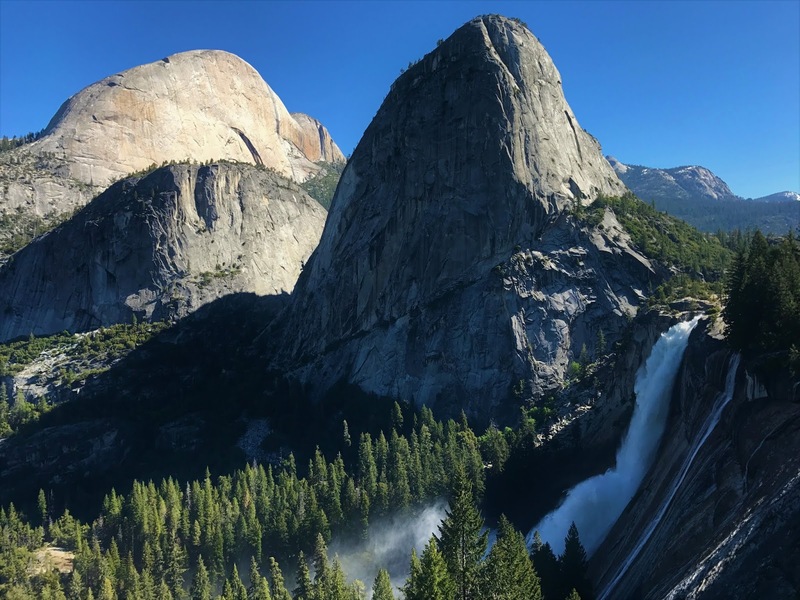 We climbed higher and higher up through valley and passed two of the most famous waterfalls in Yosemite, Vernal and Nevada falls. I started to realize why it was called the “mist trail” when we passed just under Vernal falls and got blasted by mist the whole time. By the time we reached the top, we were soaking wet from climbing the steps beside the 300-foot waterfall. The next five miles to our campsite felt like ten from all the zig-zagging we did up the mountains on the more primitive trail. As we approached the campsite we all got a boost of energy knowing that we could soon relax once we set up camp. We split into teams, two of us went to collect and filter water from the nearby stream and two stayed back to pitch the tent. I excitedly asked to be on the water team. Something about collecting water from a beautiful stream in the middle of the forest just felt right. I was very pleased with myself as I carried everyone’s water back to camp. After scaring off a coyote from our camp we cooked dinner with our little Bunsen burner. With our bellies full we went to bed early for the big day. We woke up with the sun and got right to it. Leaving most of our gear at camp we were able to take only what we needed for the final climb. Then we set off on the four-mile hike to what is called the sub dome. The sub dome is where the cables began and were the finale 400 vertical foot stretch of our journey. On our way up the trail, we snapped a selfie with the sign telling us the cables were down and it was “highly dangerous to climb” at this time of year. We figured if we didn’t come back at least there would be proof of our stupidity. I’m happy to report that we made it! As we grew higher in elevation the views around every corner became more and more spectacular. While we were just chatting about the trip back down the steps on the sub-dome suddenly disappeared under the snow. Having no idea there would be snow up there we decided to keep moving and make our own path until we reached the steps again. Maybe the snow should have been a warning, but we went for it anyway. After pushing past every obstacle in our path we finally made it. We were standing in front of the dome. No one in sight, just two little cables swaying in the wind. All the joking and conversation stopped abruptly, and I was hit with a sudden adrenaline rush at the thought of scaling this giant in front of us. I broke the silence and told everyone we should take a break to plan our ascent. I don’t how, but I ended up in the front of our single file line. We were going to lift the heavy cable together as we climb. This was it, no turning back now. We slipped on our garden gloves and one by one got a firm grip on the seemingly infinite cables. That grip was our only lifeline. And the adrenaline rush only grew as the danger felt more real than ever. So, we took our time and went one step at a time. And before we knew it we were half way up. Stopping for a break was almost impossible as our feet would start sliding and even with the best hiking boots I could feel my feet slipping on the polished granite. I couldn’t imagine doing anything less. I could feel my arms and legs shaking as we took the last few steps to the flat top of the dome. We all collapsed with exhaustion accompanied by a huge wave of accomplishment. We made it! And the view from the top was the greatest reward I could ask for. Standing on the 3,000-foot tall rock balcony overlooking the entire park was an unbelievable feeling. I have never felt a greater sense of achievement nor have I seen such an incredible view. We were on top of the world! The way down was relatively uneventful aside from the buff rock climbers we met who thought we were “savage” for climbing with nothing but our hands. It was a great feeling knowing we didn’t die!